The 2012 International Coral Reef Symposium brought over 2000 people from 80 countries together in Cairns, Australia, to discuss the fragile future of our global coral reefs and the fish stocks that depend on them. This five-day event saw around 1,500 presentations covering the whole spectrum of coral reef science, from the biological to the economic. The goal? To gather a comprehensive understanding of coral reefs past, present and future and to get the message out to policy makers and the public alike about the dire need for action to be taken to protect these precious ecosystems. 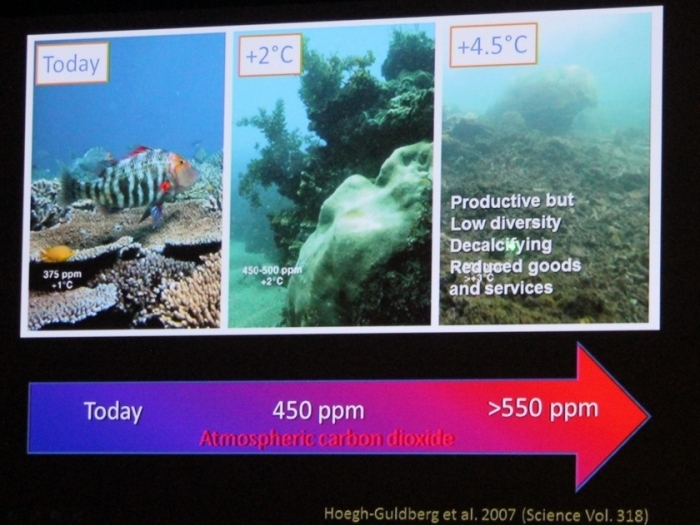 The symposium kicked off with the launch of a 'Consensus Statement on Climate Change and Coral Reefs', calling on governments to "...ensure the future of coral reefs through global action to reduce the emissions of carbon dioxide and other greenhouse gases, and via improved local protection of coral reefs". This Consensus Statement may have been supported and signed by over 3000 scientists, but as Stephen Palumbi, Marine Biology Professor at Stanford University, said during a press briefing "...scientists don't change the world, political leaders and people do". This statement mirrored the need to burn the conservation candle at both ends; globally through political action, and locally by community led conservation efforts. "By focussing on local protection, we buy time to fight off the effects of wider global issues" Palumbi went on to say. The success of community Marine Protected Areas (MPA's) in countries with the most threatened coral reefs have proven to be largely successful, and a sizeable proportion of presentations focused on the effectiveness and challenges faced by community based efforts. However, on the other side of the scale, no action has yet been taken by big business to help conserve marine ecosystems. So how can we engage the corporations that so often sit on the opposite end of environmental protection? The answer is not all that surprising. Put a dollar sign on it. Payments for Environmental Services (PES), is a market based approach to conservation financing and is based on the idea that those who benefit from an environmental service should pay for that service, and those who generate them should be compensated. Many PES programmes have been put in place in terrestrial conservation, for example downstream users of water purified by an upstream forest, such as bottling companies or local residents, pay those who manage upstream forests to ensure a sustainable flow of this service. Even though coral reefs are threatened habitats responsible for the daily food security of 500 million people worldwide, there are currently no coastal or marine based PES programmes in place. The main reason for this can be attributed to the 'tragedy of the commons', as the oceans are still mostly open access PES is not viable as a minimal level of tenure is required. A different twist on economic approaches to marine conservation presented by Melissa Bos, a PhD researcher at James Cook University, may catch the attention of businesses as interested in their profits as their environmental impact. Bos describes 'Impact Investing' as 'achieving social or environmental outcomes while also maintaining capital'. She goes on to explain how this can be achieved "by foundations investing part of their assets that they would normally put in the stock market and counter productive pursuits into things such as environmentally responsible businesses, where you are generating a profit and at the same time your achieving your (environmental) mission. An example of impact investing within the marine conservation realm would be redirecting fishery subsidies. Right now tens of billions of dollars are spent annually by governments on fisheries subsidies, 25% of the total landed value, and only 5% of those have any sort of environmental aim. But what (impact investing) can do is redirect some of those funds towards sustainable fishing companies that abide by best management practices, and they can still produce a profit while providing a net environmental benefit"." Some economists predict investments in this sector in the realm of $500 billion by 2020, making that cliche phrase 'investing in the future' a potentially profitable and genuine market. Engaging the financial market in conservation will bring it's own challenges, but the economic rationale for coral reef protection is hard to ignore. The Great Barrier Reef brings in $6 million per annum and 50,000 jobs to Australia through tourism, a thoroughly sustainable market as long as the coral reefs persist. However, the sad truth is that even the most well protected reef in the world is suffering, with a decline in coral cover of almost 50% since the 1960's. Coral reef scientists have a tough job on their hands, not only must they focus efforts toward public education and awareness, rally for governmental attention and be on hand to advise on marine policies when needed, collaborate with the media to ensure the correct messages are broadcast, and work with NGO's to initiate effective locally managed MPA's in the most threatened regions, they must also keep up their core academic research efforts. Ove Hoegh-Guldberg, Professor of Marine Studies and Director of the Global Change Institute at The University of Queensland, closed the symposium with this sentiment "if coral reef scientists want to make a difference then they have got to engage with the hearts and minds of ordinary people, so we are stretching ourselves even further, but there really is no time to dally, no time to spare". The scientists are ready, now governments and big business need to step up, put the deniers to the side and take responsibility for the future of these vitally important ecosystems and the many species that depend on them, including that invasive, formidable group, sometimes capable of incredible feats of awareness and empathy, 'homo sapiens'.